A clerk in Irene's father's office insists that he is on the trail of treasure and demands a vacation. A few days later, Larry Gibson is ambushed and shot! 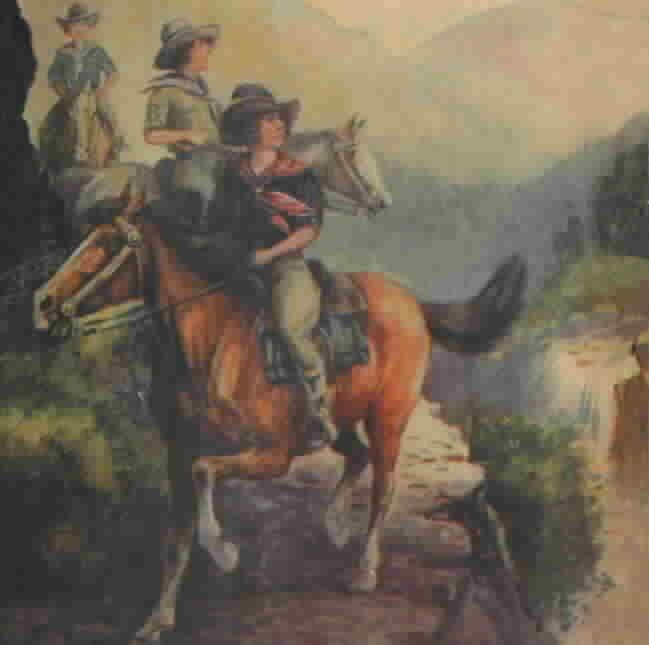 Soon after, the Outdoor Girls depart for Spring Hill Farm. At Spring Hill Farm, the girls meet up with their married friends who are already at the farm. Mrs. Farney overhears mention of Larry Gibson's name and reveals that he is her nephew. Mrs. Farney seems to think that there is something to Larry's story about the treasure and hopes that it can be found. The treasure would mean everything to the Farneys who are in danger of losing the farm. Late one night the girls see a ghost coming out of the milk house! The ghost visits several other times, but nobody can catch it. In time, the young people do lay the ghost as well as find the missing treasure. The Outdoor Girls initiate three new members, Carolyn Cooper and twins Meg and Lota Bronson into their group. Meg immediately suggests a vacation at her Uncle Dan's New Moon Ranch, and this proposition is met with approval. Before the girls depart, Meg and Lota overhear an argument between Uncle Dan and two strange men. When the girls question Uncle Dan, he refuses to give details. Meg and Lota become even more concerned after spotting the same two men at the train station in Chicago. What do the men want? The men continue to harass Uncle Dan after the group's arrival at the ranch. Meanwhile, Mollie becomes increasingly thoughtful about her own future, and everyone speculates about whether she will choose Roy or Clem. After several harrowing adventures, Uncle Dan's enemies are brought to justice. Mollie makes her decision and marries Roy. Stella Sibley is the new leader of the Outdoor Girls now that Mollie has married. Irene suggests a hike, and the five girls settle on a plan of a two week hike in which they visit all of the married Outdoor Girls. Carolyn is unenthusiastic for the trip after she learns of a robbery in which her family heirlooms were stolen. 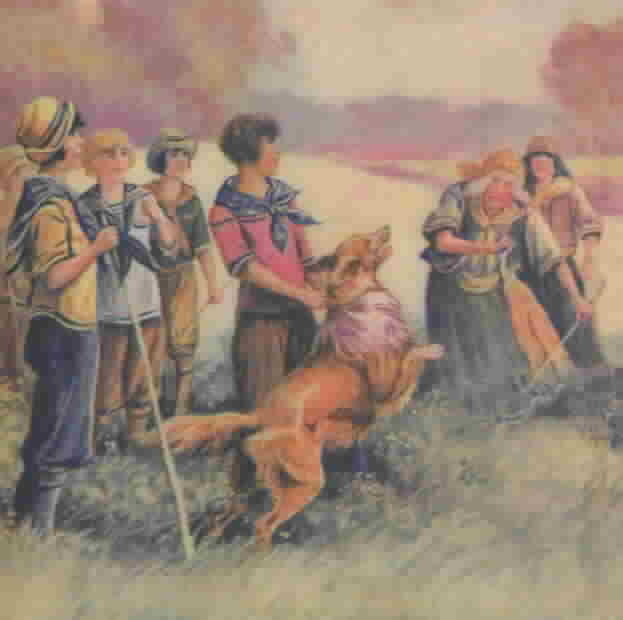 The girls are plagued by a band of gypsies who harass them as they follow the girls along the path of their hike. The gypsies turned on the girls after the girls refused to have their fortunes told. The gypsies become increasingly violent with each confrontation, and the girls literally fear for their lives. With the help of several good friends whose appearances at the critical moment save the day, the gypsies are brought to justice, and Carolyn's family heirlooms are recovered. 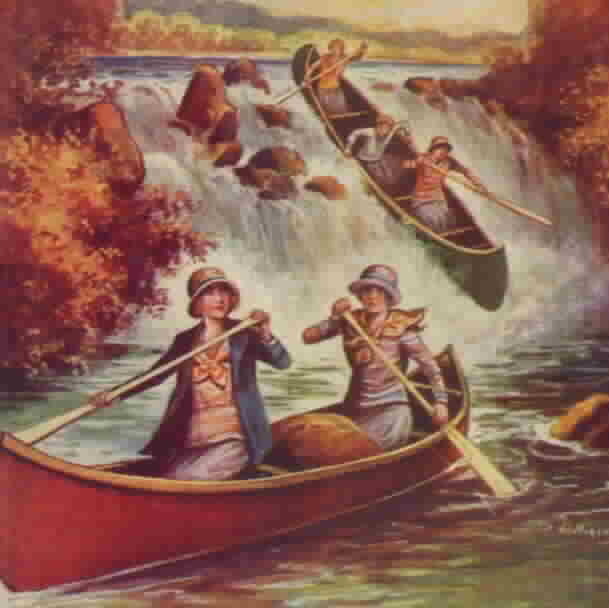 The Outdoor Girls' latest adventure is a canoe trip to all of the area lakes, which are connected by rivers and streams. Soon after the girls begin their trip, Carolyn learns that Hal Duckworth has been accused of swindling people by selling fake razor blades. Carolyn wishes she could somehow exonerate Hal. The girls depart on their trip and have several harrowing experiences due to fierce storms. During one of the storms, the girls seek shelter with an old trapper who warns them away from Tonk Lake. When pressed for details, the man reveals that an old brown mill located at the lake is haunted! 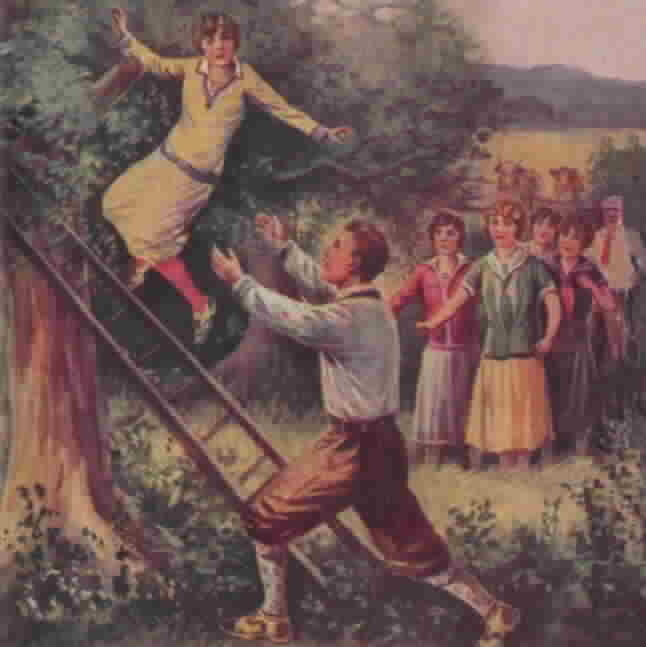 The old trapper's warning only serves to whet the girls' curiosity. 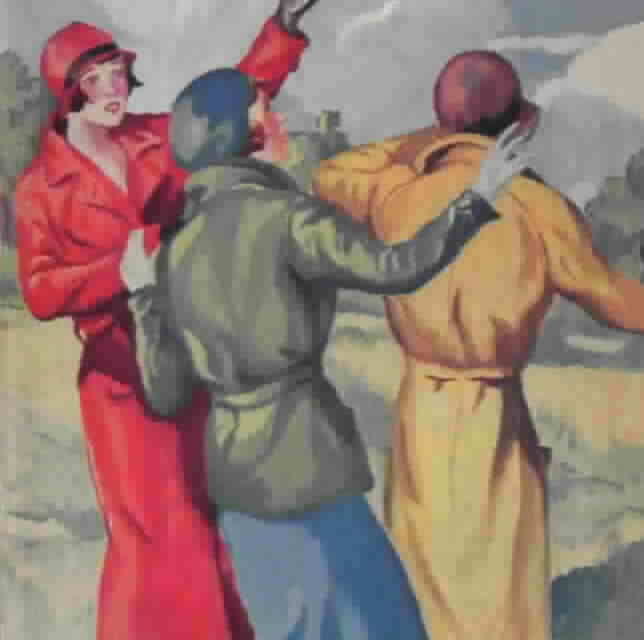 After the girls arrive at Tonk Lake, unfriendly people warn them away at the point of a gun. Undaunted, the girls investigate, discover the secret of the old mill, and prove Hal's innocence. Meg and Lota Bronson worry for their young neighbor, Sylvia Dann. Her father, Homer Dann, has disappeared, and with him, a large portion of the bank's funds. Sylvia has been placed in a children's home, and the twins indignantly fear for her well-being. Uncle Dan suggests that Sylvia come to live with him and the twins. Meg and Lota ecstatically agree, and Sylvia is welcomed into their home. The girls discover that Sylvia has emotional problems, and the girls little realize that Sylvia is upset that she cannot travel with them to Cedar Ridge. At Cedar Ridge, the girls find an abandoned windmill in the woods. Oddly, the windmill is operational. The girls feel that the windmill is the key to a mystery. 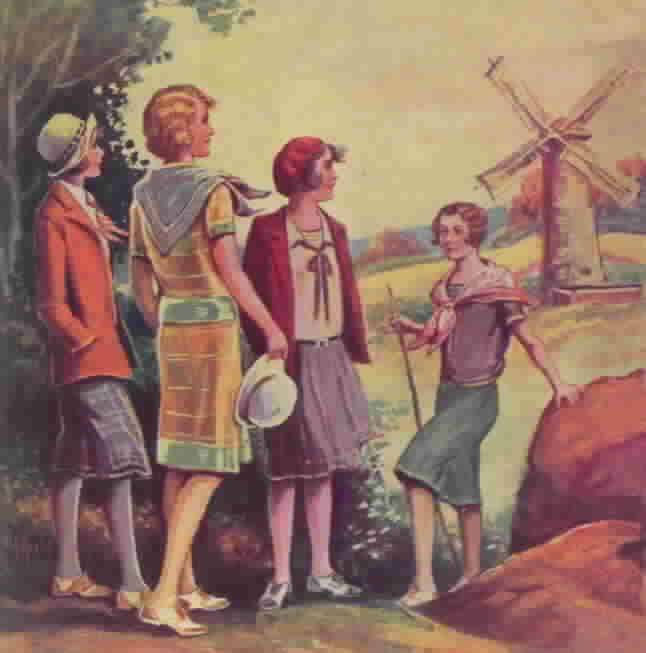 And it isby solving the mystery of the old windmill, the Outdoor Girls bring true happiness to Sylvia Dann's life. Stella is quite taken with flying and is determined to learn to fly, much to the consternation of her friends. 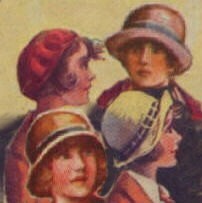 The other girls distrust aviation and fear that Stella will be killed. Stella's instructor, Bill Smith, is a mysterious sort of person who often seems confused and has fainting spells. The girls are thrilled, albeit slightly uneasy, when Uncle Dan invites them to travel with him by plane to Canada, where he must protect his interests. In Canada, the girls stay with the Dunnings and learn of their secret sorrow. Their son has been missing ever since he was wounded in the war. Stella is struck by the resemblance of the Dunnings' son to Bill Smith. Is it possible . . . ? It is up to Stella and her friends to discover the truth, bring a swindler to justice, and reunite the Dunnings with their son. The Outdoor Girls journey to Desert Valley to stay with Uncle Dan's friends who run a tourist camp. While traveling west, the girls meet John Notley and his daughter, Martia. Mr. Notley is pleasant and companionable, but Martia is snobbish and cold. Mr. Notley confides that he has been away from his childhood home for years and is eager to return. The girls enjoy riding around on the prairie, but are soon fearful of the cowboys from the X-O-X Ranch. The X-O-X boys like nothing better than to play rough practical jokes on everybody else in the territory. They kidnap Carolyn and tie her up, but her resourcefulness allows her to escape before she is harmed. In time, Martia becomes a nicer person, and Mrs. Notley joins the family at Desert Valley. 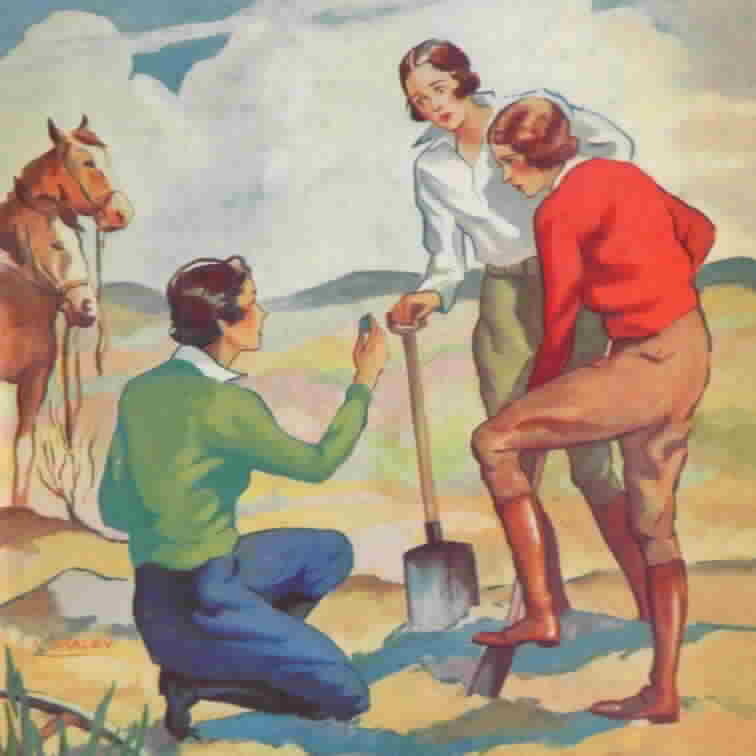 Mr. Notley gives the girls a piece of land for their very own, and the girls hope to find valuable jewels on it. In the end, the X-O-X boys are brought to justice for starting a dangerous fire, and the Outdoor Girls end their vacation happily.